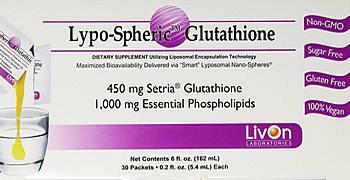 Lypo SphericTM GSH: Glutathione (Newly Formulated Batch by LivOn Labs, GUARANTEED NON-GMO) - Your Body's Most Powerful Protector - 30 packets per box. Fact: there’s no better way to supplement with GSH! Dosage and Use As a dietary supplement, take one to two packets per day for boosting the immune system and maintaining cardiovascular, hepatic and glandular health. For best results, snip or tear the notched end off the packet, squeeze into your favorite cool beverage and drink on an empty stomach. We do not recommend mixing the product with a hot beverage or with any high-speed blenders or food processors. Storage Instructions Store in a cool, dry place. Do not freeze or place the product in direct sunlight for extended periods of time. 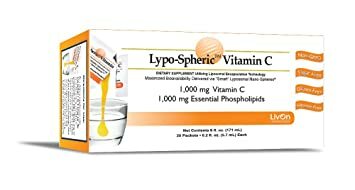 Shelf Life When stored properly, the Lypo-Spheric™ GSH will stay 100% effective for a minimum of 4 months from the time of purchase. The expiration date is on the bottom of each carton and on each packet as “XMMYR”.